Heat oven to 400° F. In a medium bowl, mix together the spinach, corn, 1 cup of the Cheddar, and 1 can of the chilies. In a small bowl, stir together the cream, the remaining can of chilies, ¾ teaspoon salt, and ¼ teaspoon pepper. Dividing evenly, roll up the spinach mixture in the tortillas (about ⅓ cup per tortilla). Place seam-side down in a shallow baking dish. Top with the cream sauce and the remaining ½ cup of Cheddar. Cover with foil and bake until bubbling, 15 to 20 minutes. Uncover and bake until golden, 10 to 15 minutes more. Meanwhile, in a large bowl, toss the cabbage and scallions with the pepitas, oil, lime juice, and ¼ teaspoon each salt and pepper. 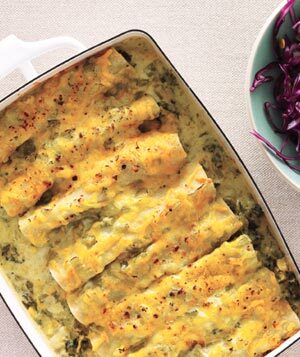 Serve with the enchiladas.